PROCON's Series 1 pumps have the protection of an integral inlet strainer. The standard strainer is a 100 mesh wire screen. It traps particles that can cause serious damage to the pump. The strainer is equipped with a removable cap to allow periodic cleaning, every 4 months under normal conditions (more frequently with hard or turbid water). The clamp-on mounting style is shown in the photo; bolt-on mounting is also available. Applications include: Carbonated water for soft drink dispensers, Espresso coffee machines, Beer cooling systems, cooling for TIG Welders, Reverse Osmosis systems, ultra-filtration systems, cooling circulation, constant temperature control, atomizing / misting systems, Automated pesticide misting systems, carwash machines, steam cleaning machines, cooling for X-Ray and medical lasers, water purification, boiler feeds, pressure booster pumps, and light hydraulic oils. PROCON's Series 2 pumps have the same features as the Series1 except they do not have the integral strainer. Series 1, 2 and 3 are available in 11 flow rates: 15, 25, 35, 50, 60, 70, 80, 100, 110, 125 and 140 gallons per hour at 250 psi. Clamp-on mounting style is shown in the photo; bolt-on mounting is also available. PROCON's Series 3 pumps boast all the unique design features of other PROCON pumps. Because the pump body and all the internal metal parts are made from stainless steel, the Series 3 is well suited for pumping a variety of fluids not suitable with brass. Your PROCON factory representative can advise you on the correct pump for the fluids you intend to use. Clamp-on mounting style is shown in the photo; bolt -on mounting is also available. PROCON's Series 4 is designed and built to meet your needs for flow rates ranging from 115 to 330 gallons per hour at 250 psi. This PROCON pump maintains all the quality features and construction of our Series 1, 2, & 3 pumps. Clamp-on mounting style is shown in the photo; bolt -on mounting is also available. PROCON's Series 5 is designed and built to meet your needs for flow rates ranging from 115 to 330 gallons per hour at 250 psi. This PROCON pump maintains all the quality features and construction of our Series 1, 2, & 3 pumps. Clamp-on mounting style is shown in the photo; bolt -on mounting is also available. PROCON's Series 6 is designed and built to meet your needs for higher flows. The flow rate capacity for this pump ranges from 300 to 660 gallons per hour at 250 psi. This series pump is available only in bolt-on style. No integral relief valve is available. Due to the elimination of the mechanical seals, PROCON’s family of MagDrives provides you with a virtually leak proof pump. They are designed for those applications which use a “hard to contain” fluid (e.g. glycols, oils, low surface tension fluids, etc.). PROCON’s Series 2 and 3 MagDrives are available in 11 flow rates: 15, 25, 35, 50, 60, 70, 80, 100, 110, 125 and 140 gallons per hour with discharge pressures up to 180 psi. Brass or stainless steel construction is available. Due to the elimination of the mechanical seals, PROCON’s family of MagDrives provides you with a virtually leak proof pump. They are designed for those applications which use a “hard to contain” fluid (e.g. glycols, oils, low surface tension fluids, etc.). PROCON's Series 5 MagDrive pump is designed and built to meet your needs for flow rates ranging from 115 to 330 gallons per hour at 250 psi. This PROCON pump maintains all the quality features and construction of our Series 2 & 3 MagDrive pumps. Due to the elimination of the mechanical seals, PROCON’s family of MagDrives provides you with a virtually leak proof pump. They are designed for those applications which use a “hard to contain” fluid (e.g. glycols, oils, low surface tension fluids, etc.). PROCON's Series 6 MagDrive is designed and built to meet your needs for higher flows. The flow rate capacity for this pump ranges from 300 to 660 gallons per hour at 250 psi. No integral relief valve is available. The CMP-7000 is a wonderful advancement in pump technology; offering the benefits of longer service life and lower life cost. The CMP-7000 is an integrated canned pump / motor package featuring a single shaft design. It has a 2 year limited warranty and offers run dry capability. The pump is designed with PROCON’s patented thermal protection allowing the pump to automatically cut off in a run dry scenario and then recycle every 10-15 minutes until the run dry situation is remedied. This patented thermal protection allows the pump to run in a dry environment without damage to the internal carbon components. PROCON's saltwater pumps are designed for use in brackish water or sea water. These pumps are comprised of an austenitic stainless steel, 254 SMO, which possesses very high resistance to pitting and crevice corrosion. This Grade of steel is superior to 303 or 304 stainless steel. Internal components are composed of 316 stainless steel. A single piece rotor is used to prevent shaft separation. Requires a freshwater flush. Available in Series 3 (Bolt-On) or Series 5 (Bolt-On or Clamp-On) configurations. Applications include: Desalination, Reverse Osmosis, any application involving Brackish or Saltwater. The 48YZ Frame Motor is mainly used for lower horsepower applications. It is available in 1/4 HP, 1/3 HP, 1/2 HP, and 3/4 HP models. The 56C Frame Motor is mainly used for higher horsepower applications. It is available in 1 HP, 1.5 HP, 2 HP, and 2.5 HP models. PROCON's V-Band Clamps are used to attach pumps with clamp-on style mountings to 48YZ Frame Motors. This unit is used to attach pumps with bolt-on style mountings to 56C Frame Motors. PROCON's different styles of couplings and mounting arrangements can be tailored to optimize service life and minimize down time in certain applications. 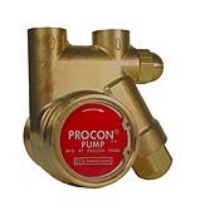 PROCON's external bypass valve provides the protection of PROCON's patented relief valve system to any style pump. It also removes the recirculation path from inside the pump to the external bypass, thereby reducing damage to the internal components of the pump due to the heat produced by excessive recirculation.